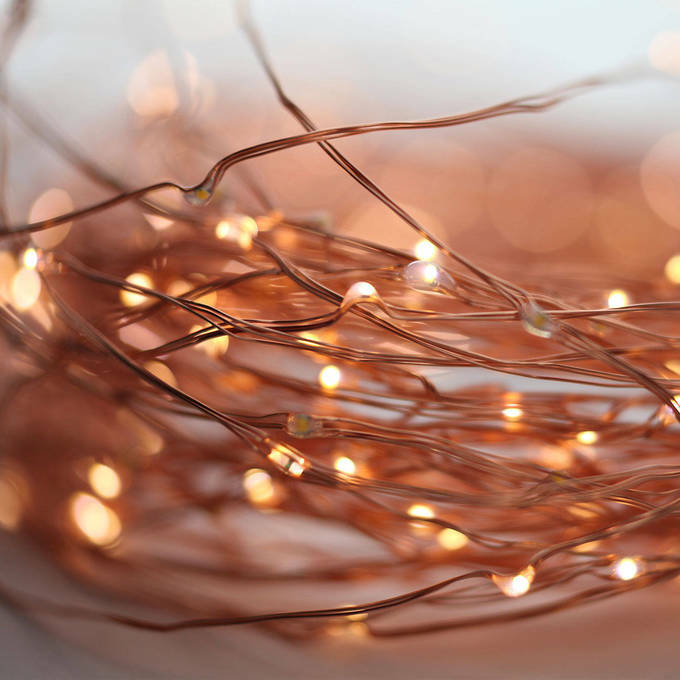 There are only 660 available of the Starry Warm-White Copper Fairy String Lights, 100ft. Your selected quantity has been adjusted. 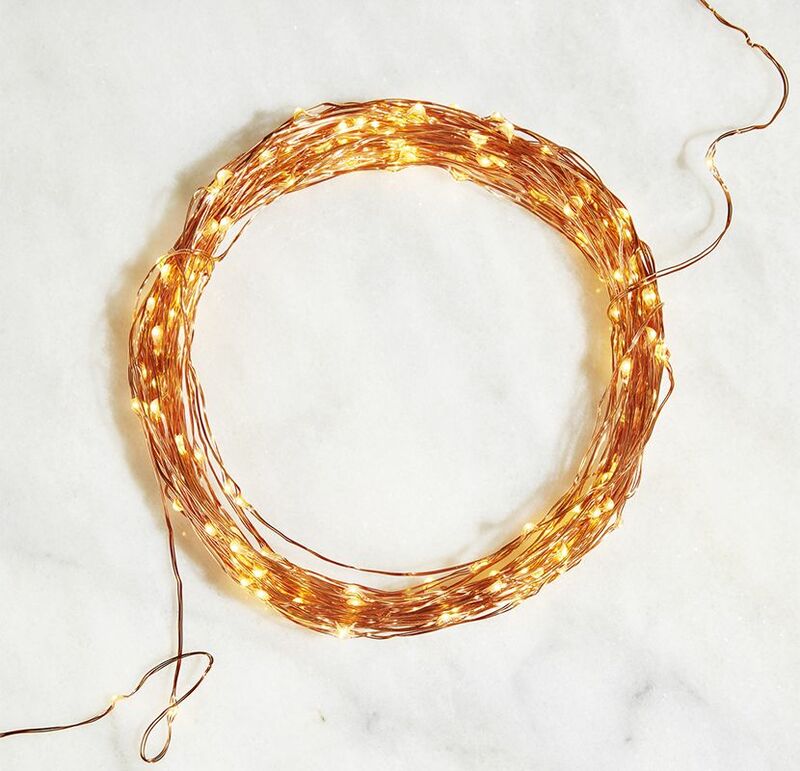 Wrapped around tree branches or stuffed into a modern glass vase, these low voltage warm white micro LED lights, with their pliable copper wire strings are a perfect fit for even the most intricate of designs. Each of these plug-in strands include 300 warm white LEDs and a switch to activate a 6-hour timer option for hassle free installations. I used these to decorate the perimeter of my room and to have a place to hang my mini polaroid pictures. The lights are really cute and give my room a warm and relaxed feeling. I bought two sets of solar fairy lights and have been really pleased with the way they are working. So pretty at night. Just what we ordered! Nice and bright just how we thought it would be! Thanks!!! The lights are beautiful and very easy to work with and install. 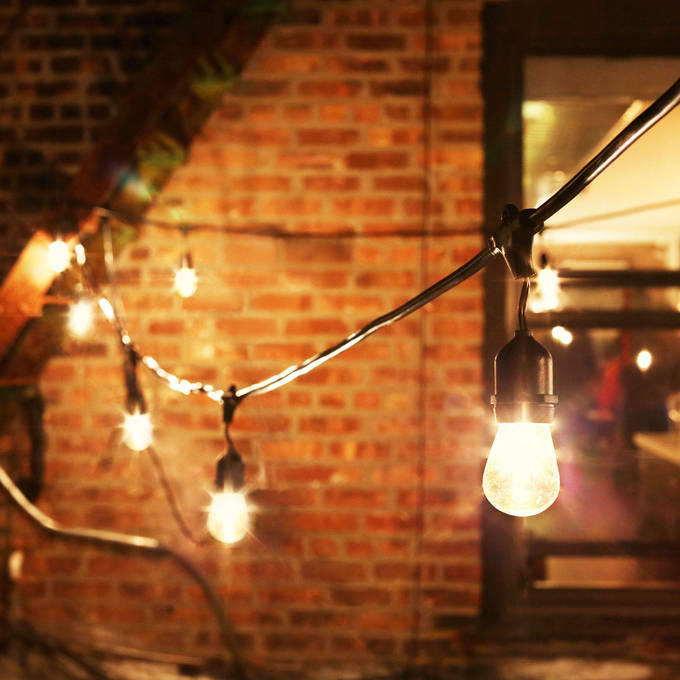 Two sets of 100-foot lights are strung across our 15-foot ceilings. I love them! Can't give them a 5 though, because the timer is slightly off - starts 10-15 minutes earlier each day and lights stay on less than 6 hours. Since there are two strings, it was gamble that would work out anyway. Bought these fairy lights for my daughters bedroom, exactly what I expected, great quality, fast shipping and great customer service. Got these fairy lights for my Christmas tree. I was a little skeptical when I saw the little box. Then I wasn't sure if they would be bright enough. Well I just finished my 8' tree and I have to say my tree is beautiful. These lights brought my Christmas tree light storage down from a tub to a box. Love it. These lights, though more yellow in color than we expected for warm white, are really wonderful And the folks at Lights.com were super helpful in expediting the order for us to make a deadline for a surprise party. 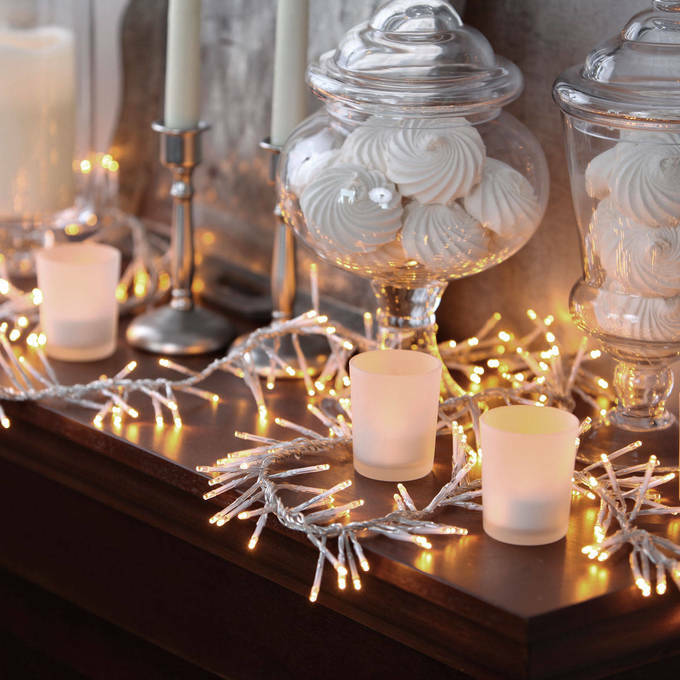 Put them around our apartment for an extra sparkle. They aren't as bright as I would have hoped but they look fantastic! Would highly recommend! 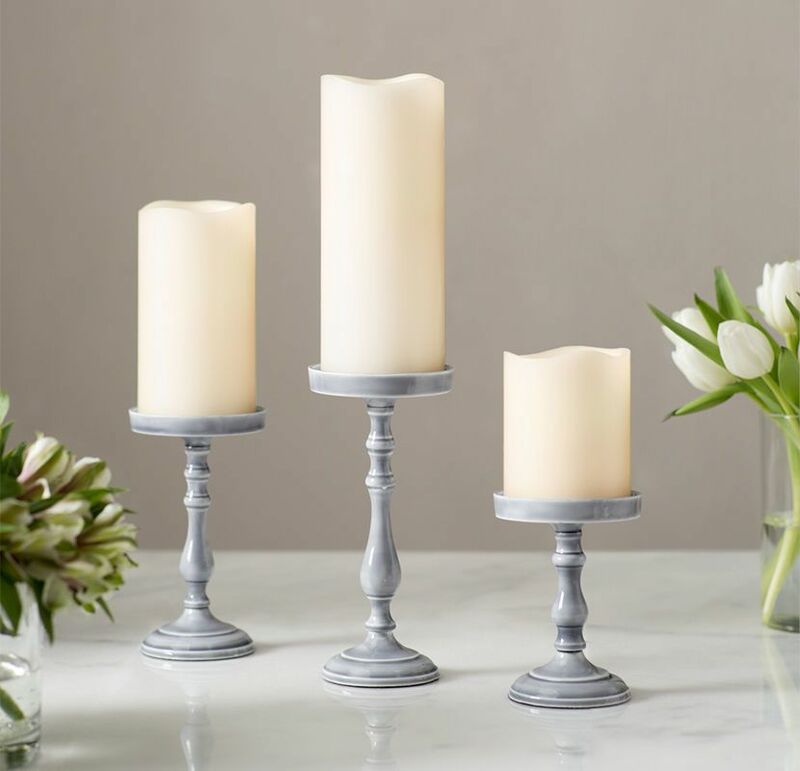 Bought them to light up our barnвЂ¦.theyвЂ™re perfect! GRAND! NICE ATMOSPHERE MAKES A RELAXING SPOT TO CHILL OUTВЎВЎ!!!ВЎ!!! These are just as warm as other reviewers described them. They very warm, which is much nicer than most fairy lights. I returned two competitor's purchased on Amazon because they were not "warm white' as claimed, but were harsh, super bright white. These are great by comparison. The strand is also exceptionally long. I installed them in my 11x 11 room around the perimeter and they are doubled in that space, which creates much more light than anticipated. These come with a 6 hr timer feature, which is not very practical if you wish to use them as reading lights. You'll be waking up as they turn off. The lights are wonderful and very bright. The wiring is well done and safe. The price was ok. No problem to report with the vendor.I would highly recommend this product and this site to my friends (I have already). The lights are exactly as pictured; a lovely soft white glow. I have purchased cheaper starry-type lights elsewhere but the harsh glaring white lights is positively ugly. I love the Lights.com lights. Unfortunate that they aren't provided with a transformer that accommodates 110 and 240 as I live overseas. They don't have anything similar but I was able to have them rewired with an alternative trans. Perfect touch over my reading corner. Will buy this product again once I find another decor diy for it. Nice warm glow. Will be buying more. These lights were exactly what I was looking for. Long continuous string perfectly spaced, plug-in with a timer. Well worth it. Love them!! 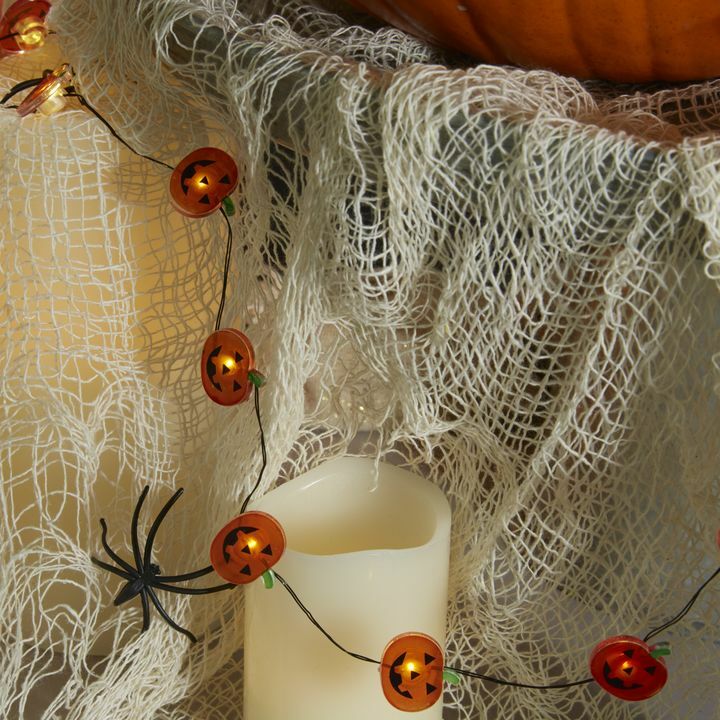 These lights are perfect for using in the Day of the Dead Nichos I make. They make the Nichos really unique. I would definitely re-purchase these lights. The lights I purchased arrived in a timely manner and were just what I expected! Thanks! I have these lights zigzagged through an outdoor arbor alongside a flowering vine, looks amazing. I love the length of the strand.We ran it back and forth across the ceiling like stars. The soft yellow light is cute and cozy. This is second set of these I've ordered from lights.com and I'm planning on ordering more. I love them. There is some much you can do with these lights. They are perfect for decorating. They shipped really fast too! They are gorgeous! Will be buying more. Shipping was fast too! A fantastic amount of lights for the price, and their tone is warm rather than cold as so many similar products are, which I love. They aren't perfect, as I have found sections of the strip will go dark if they aren't in the right position, and I wish they had some kind of adjustment for the brightness (they actually manage to be too bright for the small space I'm using them in!) but overall I'm very pleased with my purchase. I absolutely love my fairy lights. They arrived quickly and are now adding the perfect ambiance in my bedroom. I wrapped them around my room along the walls where they meet the ceiling. I love the six hour timer too, it comes in handy when I have them on a couple hours before bed and fall asleep with them on. I will definitely be buying more. Is it possible to get a replacement power supply? Our lights keep on turning themselves off and I think it is because the power supply burned out. If the power supply is not working; the strand may need to be replaced. You may contact our Customer Service Line at 866.490.9358 for assistance. Are these lights connectable? 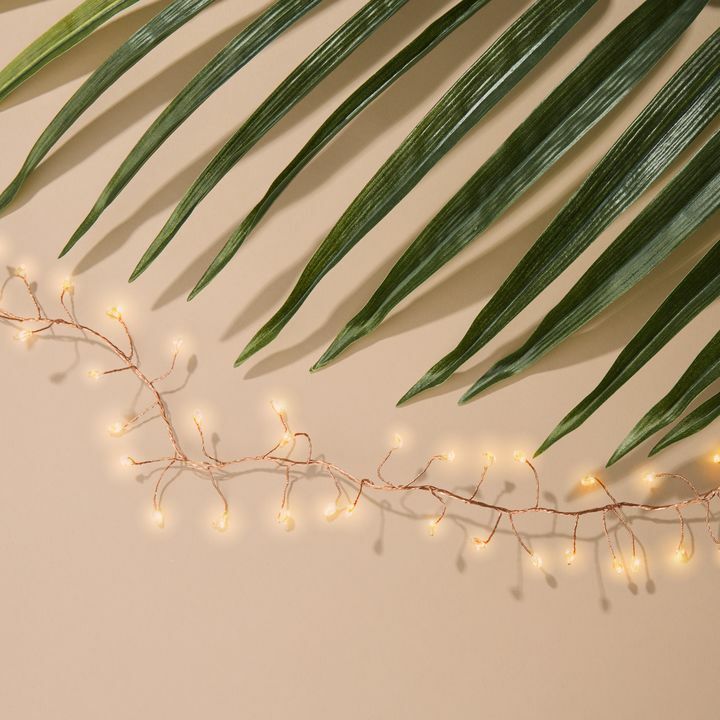 I am ISO 500 ft of fairy lights for outdoor use and I'm hoping 5 of these would do the trick? If not, any alternative suggestions for me? If so, do you have any outdoor nighttime images of the bright white v the warm white so i can assess which one I would like more for our front yard tree? Thank you!! 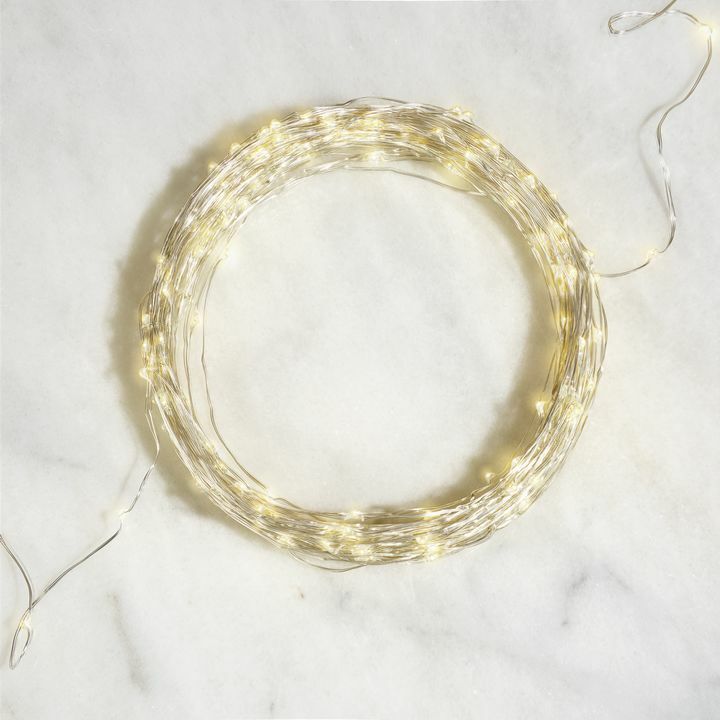 The Starry Bright-White Silver Fairy String Lights, 100ft are not connectable. The Lights I would recommend for an outdoor tree would be the Super Bright Plasma Expandable LED Plug-in Rope Lights, Warm White. 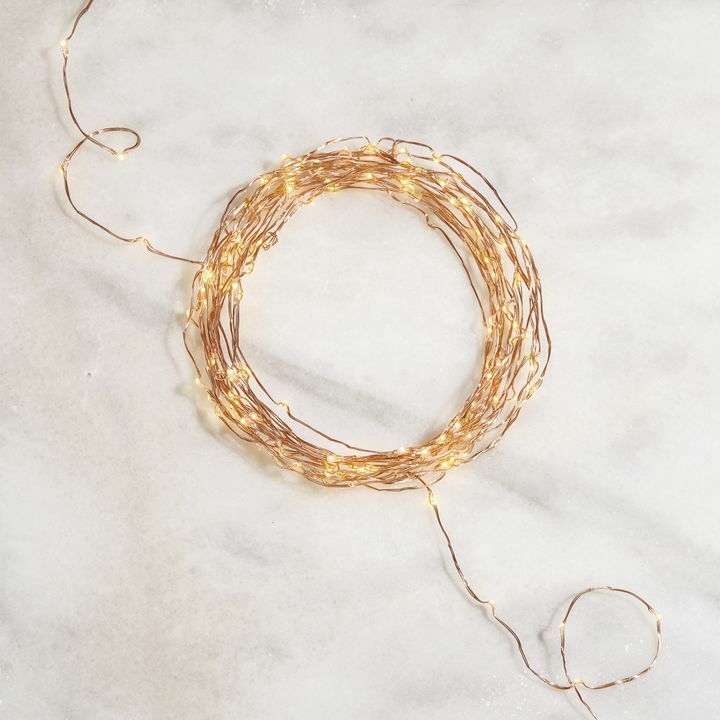 It is a durable rope light that glows a versatile, warm white making it perfect for all year round. The Starry Bright-White Silver Fairy String Lights are very light and they hold their shape well, so there are a lot of options available for hanging them on a will. We prefer using paint-safe removable hooks, but we've seen people use staples, pin nails alone or with picture hanging hooks, or even plain clear tape. Each option has pros and cons. Do you sell a 100ft set without the timer that plugs into an outlet? I don't need the timer as I have an outdoor timer. All of the fairy lights have the 6-hour timer feature. It comes with the ON | TIMER | OFF. If you do not want to use the timer feature, you can just use the ON or OFF switch. In terms of the plug-in instead of the battery box, we have the 32ft Fairy Lights that comes with both plug-in and battery box you are able to choose from. However, the 100ft is only battery operated. Thank you for your question. We do not recommend using an adhesive like glue as doing so would void the product's warranty. We would instead recommend using clips to hang the lights on a wall. What is the length of cable from the lights to the timer and from the timer to the plug? Are either the timer or plug component waterproof or water resistant for outdoor use? Great question. The wire from the plug to the timer is 12". The wire from the timer to the first lights is about 4.5'. The timer and plug are weather resistant, meaning that they are sealed and should survive fine under normal weather conditions, but are not rated for extreme weather such as hurricanes or sever rain. They should not be submerged. Is this 3 strands of 300 lights each? 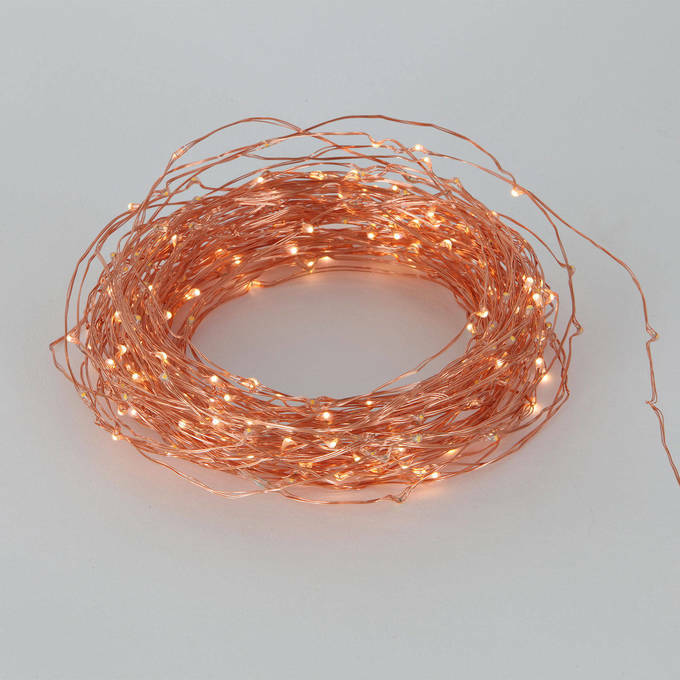 The 300 Warm White Starry LED Copper Wire Plug-in String Lights with Timer is sold as one strand with 300 LED lights. I bought 3 sets of these do they get really warm are they safe to use hung behind tool fabric for wedding draping on ceiling? They don't get warm at all and should be just fine in that setting. Roughly how many lumen will these lights create? Are they bright enough to warmly light a patio or deck? It's 300 Lumens and compliments any setting. I know they plug in to a 110V outlet. What voltage goes to the lights? Is it DC or AC. Can I connect two sets together? No these are not connectable. IF they are plugged into a switched outlet, will they come on when the outlet is turned on? I want to plug them into a place that is inaccessible. As long as the lights are left in the on position we see no reason why not. This item is plug in only. Would these work well as "twinkle lights" above a wedding reception dance floor? Or are they meant to just be used bunched up like in the picture? They can certainly be outstretched to add ambiance to a setting. Are these lightweight wires. I plan to put them on a 6 foot crown of thorns plant. I couldn't use regular christmas lights because they weigh down the branches too much. Thanks. They certainly are. Very, lightweight. the string itself is only about a lb. Do you sell battery operated timer stringer lights for outdoor? How do you set the timer to turn on at a certain time and off at a certain time? Press the on button once for timer, twice to make it run continuously and a 3rd time to turn it off. How is the six hour timer set? Where can I find instructions please? The first setting (button click) on the battery box will set them to the 6-hour timer mode. Do these lights have a dimmer? And are they REALLY warm - i.e., more amber?? These lights do not have a dimmer and the color is warm white which is more towards an orangish-yellow color. It can come off a little amber since it is paired with the copper wire. We do not recommend to cut them for a shorter length, it will void the warranty for them and may damage the entire strand. We do have these in either 12ft or 32ft. can you plug 2 strands together? You mention a plug in adapter, does it also work on batteries? 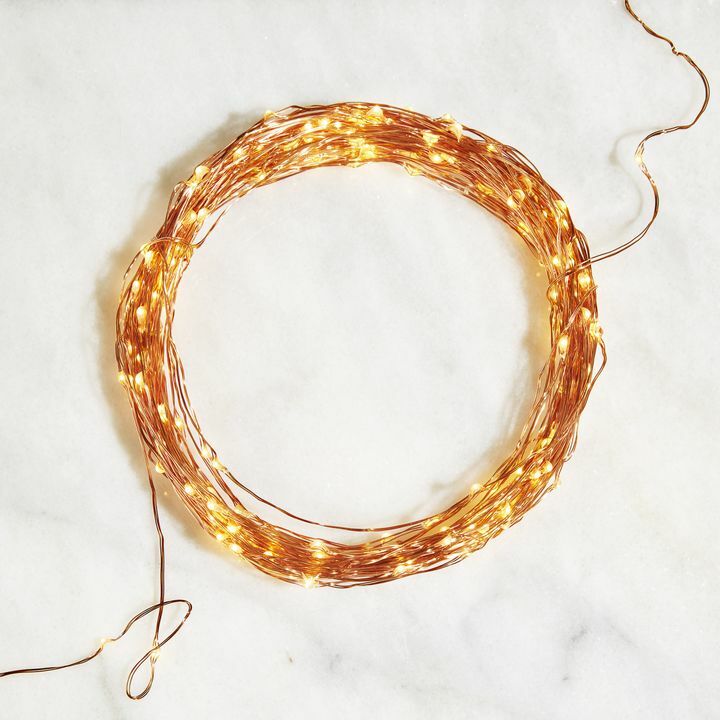 These are plugin only but we do carry the 32ft copper wire fairy lights that have both options of plug-in or battery operated. Do the light automatically turn on the next day at the same time if the timer is set? How long do these lights last? If handled/stored correctly, they should last about 40,000 hours. 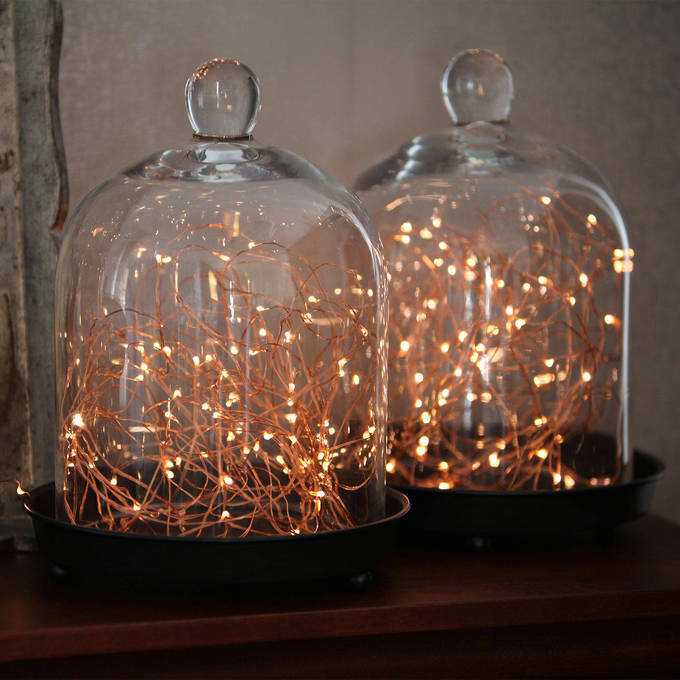 You show a glass dome and black tray when depicting the copper wire string lights on your home page. Do you sell those glass domes and trays? No those were purchased from Ikea for production photo purposes. 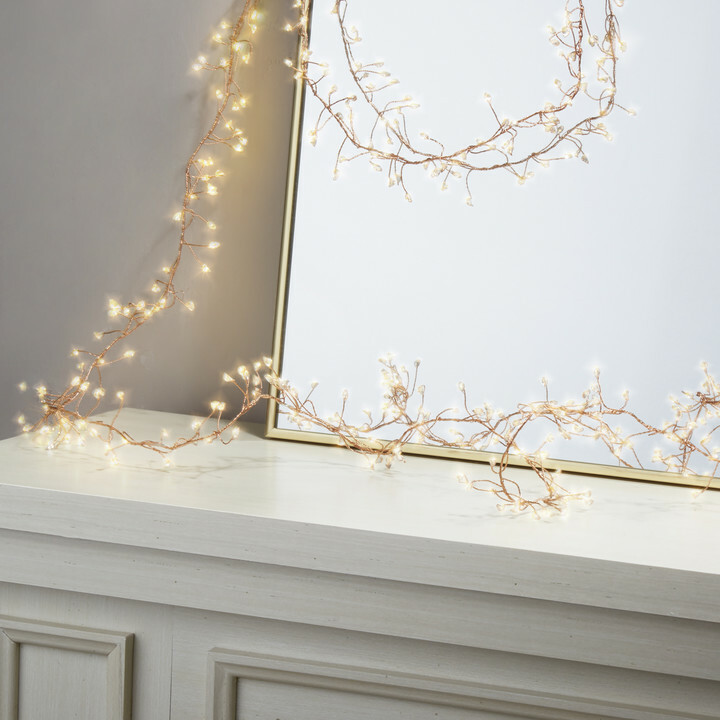 Featuring charming, delicate lights on flexible metallic wire, our collection of fairy light strands add a touch of magic wherever they're hung. 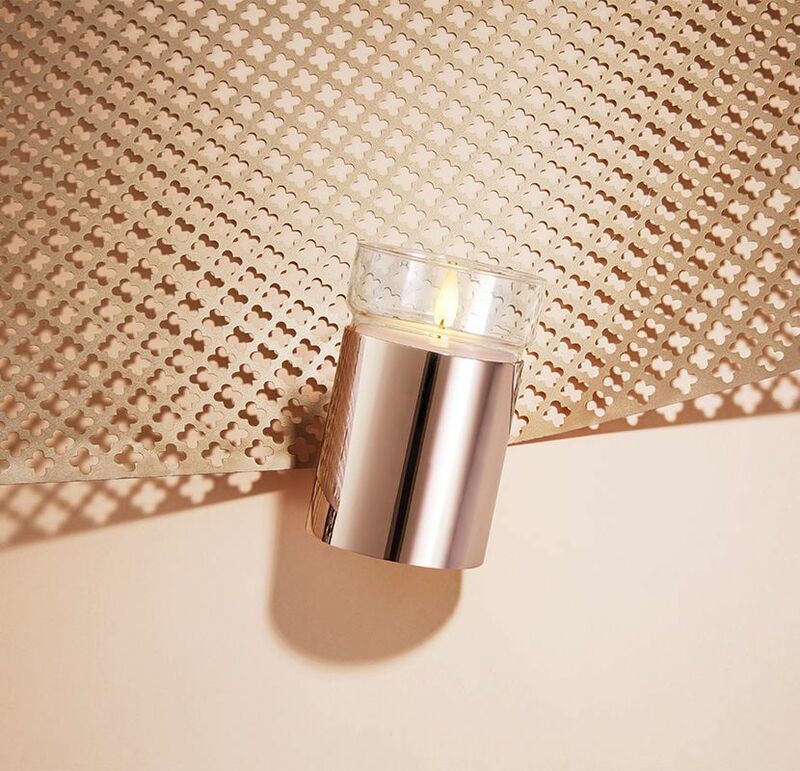 From warm and inviting to cool and classic, shimmering metallics to festive evergreen, our wide selection offers the perfect fit for your home's decor. Mother’s Day is just around the corner. It’s once again the time of year we rack our brains trying to find the perfect gift. To take off some of the stress and give you a few ideas, we’ve put together a small guide of simple, thoughtful gifts that will give Mom all the warm feels. The hearth is a cozy space to gather up the family and relax into the evening, a romantic focal point, a mood-setter that can elevate an entire space with a sense of tradition. The smoke, ashes, excessive heat, work, and hazards associated lighting a real fire do nothing to add to the charm of a lit hearth in a family room. 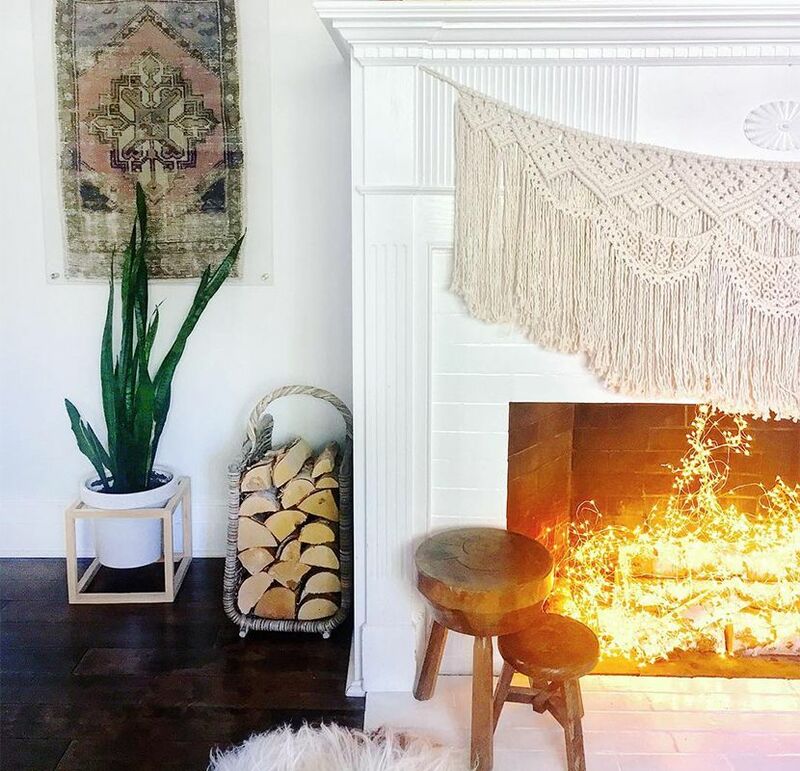 Whether youâ€™ve decided that a real fire is just too much or your fireplace is really a faux fireplace, think outside of the (fire) box and set the room aglow. 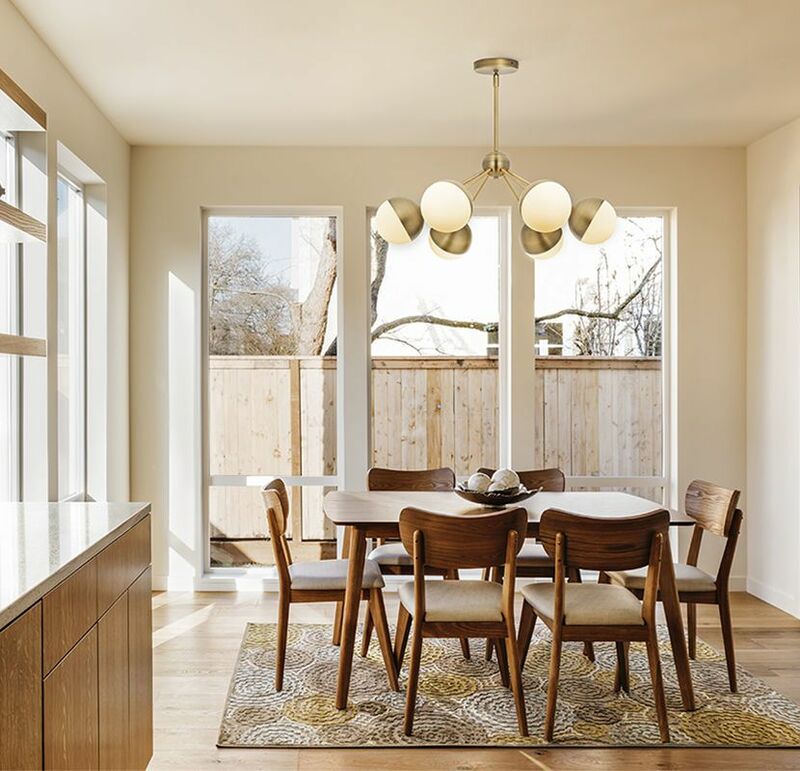 Turning Your Dining Room Lighting Ideas into Reality The dining room is the heart of the family, the place we come together to share everything from grand parties to the daily moments that define our lives. Home work and holidays, checkers and celebrations, the dining room table is the center meeting place for family life. 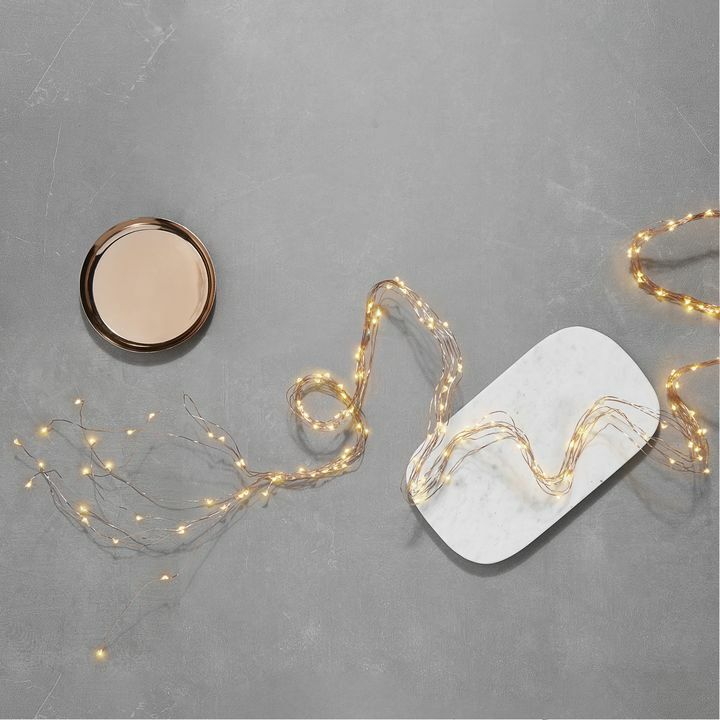 In this 101 we share some ideas and tips on how to get the perfect glow for all activities and occasions. Valentine̕s Day is almost here. You worry about the flowers, we̕ll take care of the rest. 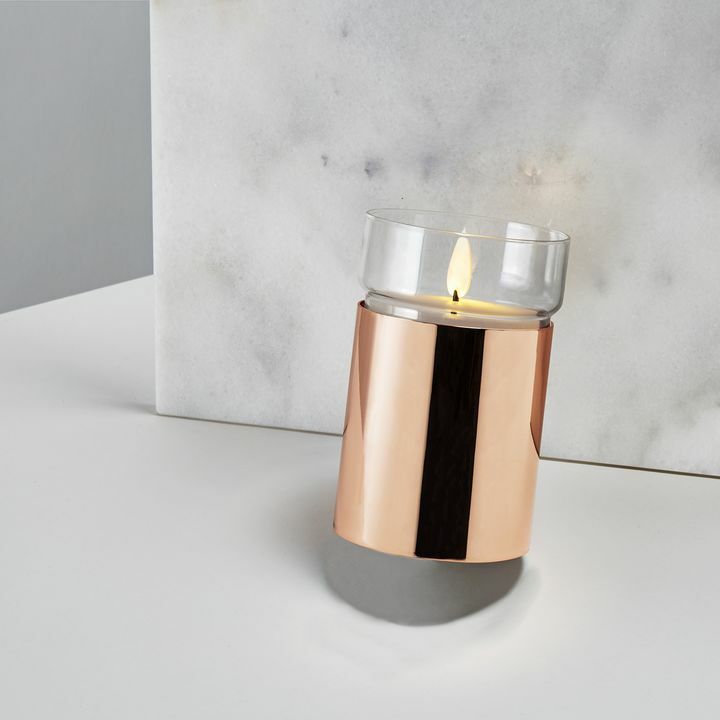 Shop our collection of ambient candles to help you set the mood for the big day. 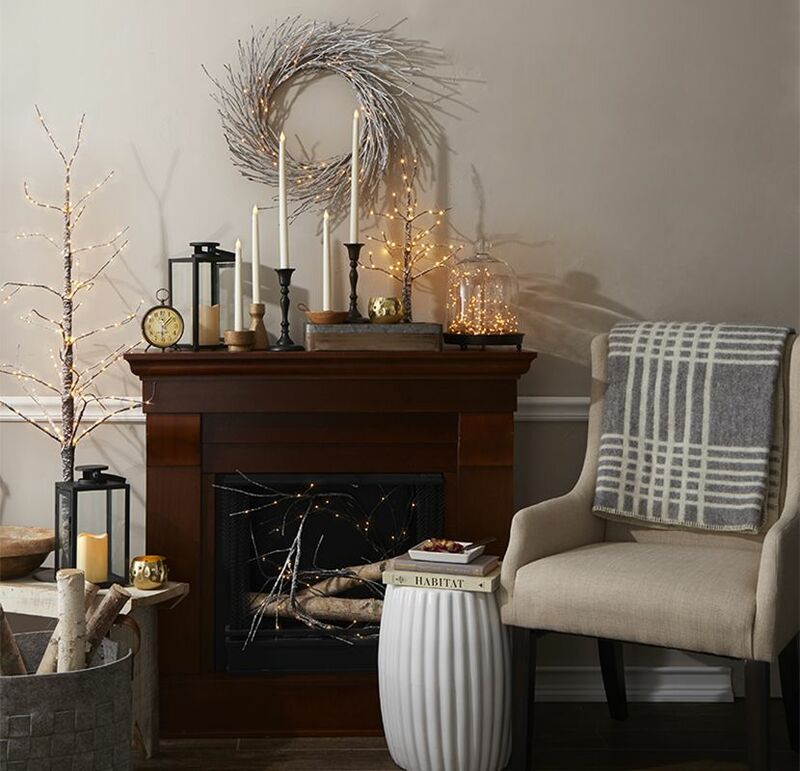 Our Modern Rustic Collection brings the warmth and comfort of a cozy winter cabin to the modern home. Just in time for the holidays. 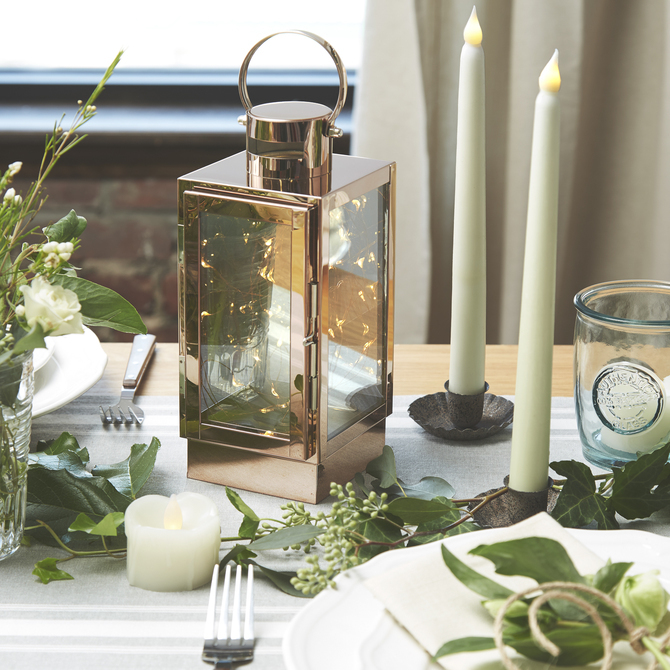 Here you'll find candlesticks and lanterns in dark or woody hues paired with garlands, wreaths, and trees in classic wintry, whites - all illuminated by the soft light of inviting, ivory candles.